Baird's book makes Victoria feel like a real person. She also does a wonderful job of contextualizing the lives of the British royals at the time, providing details about contemporary life at the time. I love the little moments when she steps back from Victoria to remind us of what her contemporaries -- like Florence Nightingale, Charles Dickens, and George Eliot -- were doing at the same moment. We're reminded of precisely how much changed in Britain from the beginning of Victoria's life until the end, and it helps make the entire narrative much richer. If you're also looking to brush up on Victoria's life story before watching the television show, I'd definitely recommend this book. 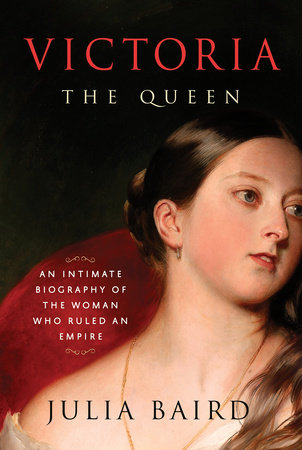 I've reviewed other books about Victoria here on the blog, including A.N. Wilson's Victoria: A Life (which is now available in paperback). Baird's book, though, is the most personal portrait I've read of Victoria in recent memory. I'll definitely be consulting it often as I write my recaps! Note: I received a copy of the book for review purposes from the publisher. All opinions presented here are my own. The links in this post are Amazon affiliate links; all proceeds from these affiliate links are used to buy more materials for review here at the blog.